How to Make Fizz Bombs! We’re making fizz bombs today babes!! If you have a daughter, you’ve most likely heard of the L.O.L. Surprise Fizz Factory, yes?! This was one of those toys Savy could not stop talking about. Every time she’d see the commercial for it on TV she’d come running to find me so we could add it to her wish list for Santa!! 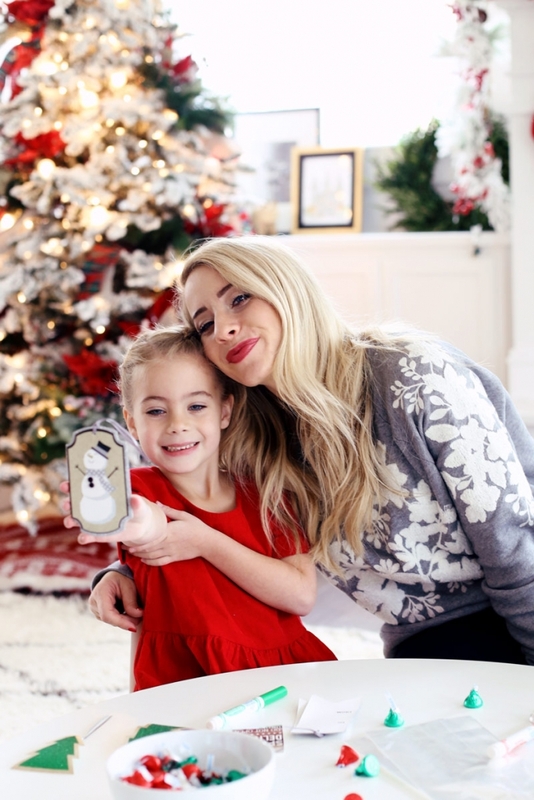 Well this lucky girl got to open her present a little early so that we could show you how it works but more importantly, how we’re using it together to make cute little gifts for her friends for Christmas! 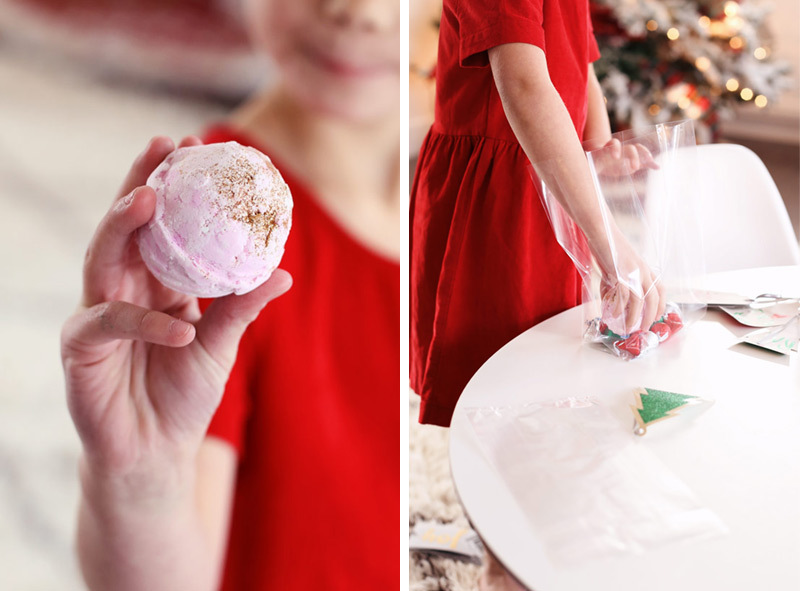 Bath bombs have been all the rage this past year and they make such fun presents! They’re fairly cheap, can be made with ingredients you already have in your pantry and you know me, I’m all about those gifts from the heart! 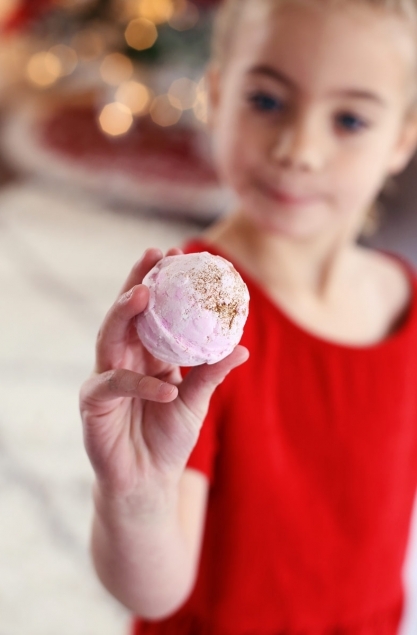 If you’ve ever tried making bath bombs on your own, you know they can be pretty tricky! They make a mess, they’re hard to mold and they’ll crack and crumble if you don’t pack the ingredients just right. We got the L.O.L. 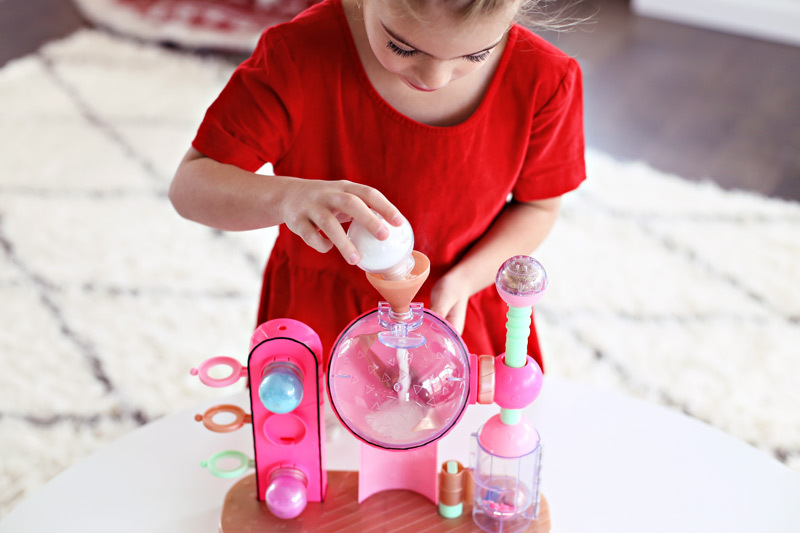 Surprise Fizz Factory from Walmart, and it is the cutest little contraption that makes fizz bombs the easy way! Walmart has ALL the top toys for kids this season! 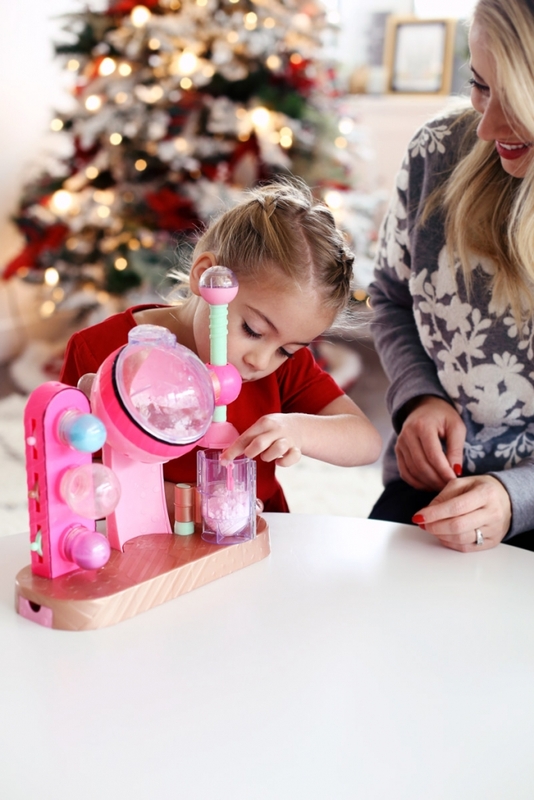 You mix the ingredients, add a cute little surprise toy in the center, sprinkle on glitter and then press everything into a little surprise ball! The factory makes it so easy that a five-year-old can do it and the mess is contained and easily cleaned up! Step one: Pour the small ball of baking soda into the large mixing ball by using the funnel. Step two: Add in one small scoop of color, mix it all together and then add 20 drops of water. Note: Don’t add too much water, I had to help Savy with this part because she had a hard time squeezing out one drop at a time! Step three: Add one large scoop of the citric acid mix and turn the handle until the mixture is a sand-like consistency. Look at those little faces just concentrating away! I was right there with Savy the whole way, I think if your daughter was maybe 10+ she’d be able to do it all by herself. Because Savy is younger she needed help here and there but it was such a fun activity to do together! Now that everything is mixed, you’re going to start making your fizz bomb! Empty half the mixture into the clear container positioned under the mixing ball. Then you’re going to swing the container out so you can add your little surprise! The factory comes with three but we’ve found that Shopkins (check out Walmart for a huge selection!) are the perfect size! 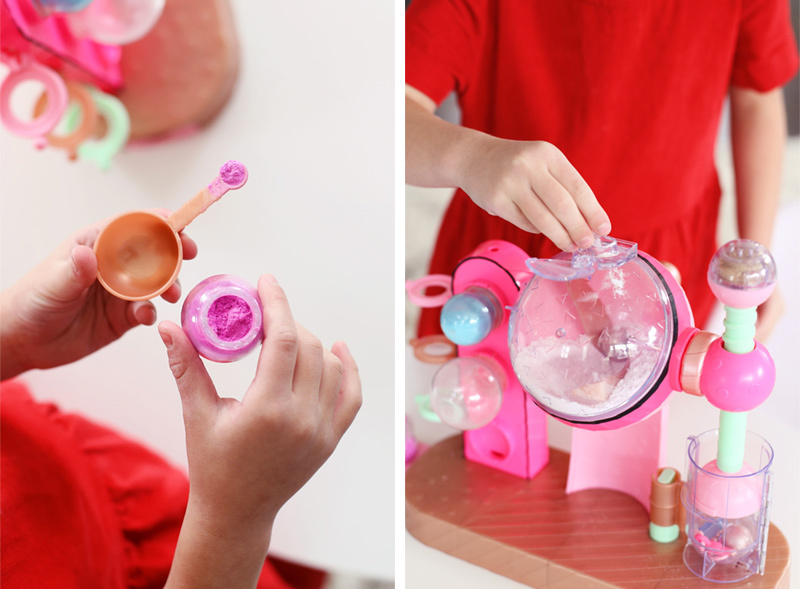 Swing the container back under the mixing ball, release the rest of the ingredients and then you’re ready to add your glitter and start packing! You align the little arrows on the factory and then twist the baton to compress the mixture. It was super easy, we even had Coopey helping us for a minute!! Once it’s compressed, you let it dry for 30 minutes before opening up the clear container. 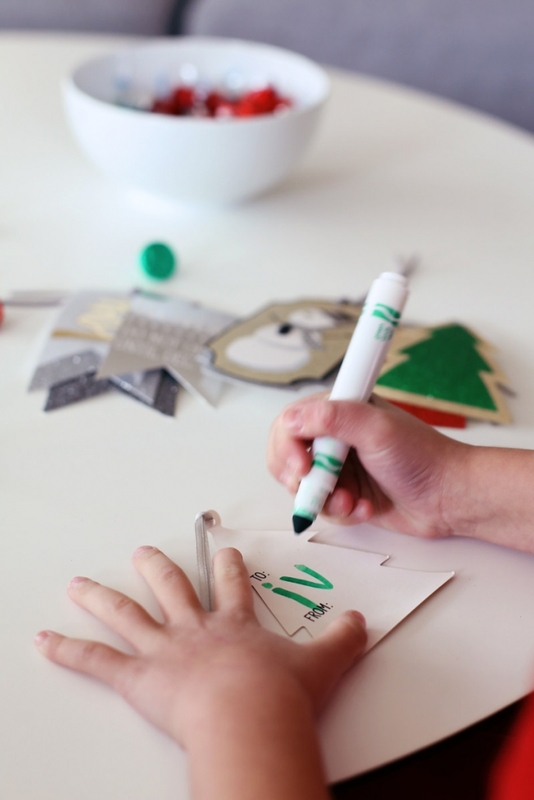 I do wish it came with two containers so you could make one right after the other, but it was fine because while our little fizz surprises were drying, we started filling our bags and making cards for Savy’s friends! It can be a little confusing making the fizz balls on the first try because you’re still learning the recipe and how everything works, but I promise it gets easier! When you run out of ingredients you can use whatever you have at home and even experiment with different recipes. I want to try adding a drop of essential oils to the next batch we make! Two quick notes: When refilling the baking soda ball, we just used a 1/2 tsp to fill it up. If the baking soda gets stuck in the funnel so you can use the small scoop to help push it through, or just tilt the factory and open up the large ball. Your daughter will definitely need help, but it made things go a lot faster! Savy literally has the cutest handwriting in the entire world. Five year olds are my very favorite! Once the fizz bomb was dry, she added it to the bags full of treats, then we tied a little ribbon around the cellophane bag and attached the cards! 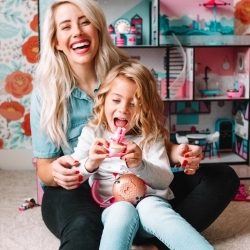 If you’re looking for a fun activity to do with your daughter, the L.O.L Fizz Factory definitely fits the bill! 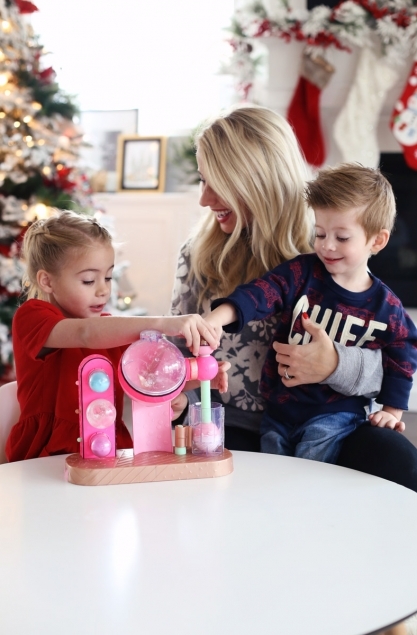 It’s one of the toys that she’s most likely seen all over the tv and on YouTube Kids and one that she’d be so excited to open on Christmas day! Or you can be like us and buy it early so you can spend some quality time making Christmas gifts for everyone! And if you’re looking for more gift ideas for kids this holiday season, check out my round up of all my favorite toys from Walmart here. Thanks Walmart for sponsoring this post, all thoughts and opinions are my own! Unboxing the three hottest L.O.L! Surprise toys!